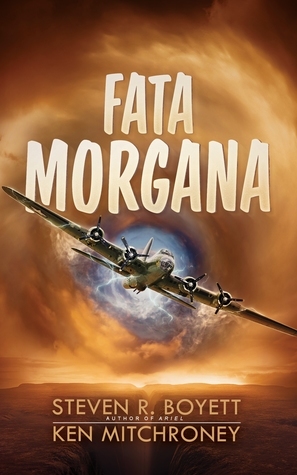 At the height of the air war in Europe, Captain Joe Farley and the baseball-loving, wisecracking crew of the B-17 Flying Fortress Fata Morgana are in the middle of a harrowing bombing mission over East Germany when everything goes sideways. The bombs are still falling and flak is still exploding all around the 20-ton bomber as it is knocked like a bathtub duck into another world. Suddenly stranded with the final outcasts of a desolated world, Captain Farley navigates a maze of treachery and wonder—and finds a love seemingly decreed by fate—as his bomber becomes a pawn in a centuries-old conflict between remnants of advanced but decaying civilizations. Caught among these bitter enemies, a vast power that has brought them here for its own purposes, and a terrifying living weapon bent on their destruction, the crew must use every bit of their formidable inventiveness and courage to survive. Fata Morgana—the epic novel of love and duty at war across the reach of time. This book made me a little sad in spots because my grandfather was a gunner on a B-17. He didn’t serve in Europe, though, he served in the South Pacific. It wasn’t until my son, then 5, started expressing an interest in airplanes, that he started talking about the war. Of course, he didn’t tell my son everything, just the names of the planes he flew on and he had pictures of “the ladies” as he called the planes. My son was fascinated that planes had people painted on them and was fascinated that Papa shotguns out of the back at the bad guys. He didn’t understand why Papa got weepy eyed when talking about people he served with who were KIA. When he passed in 2015, we found his medals as we were cleaning his apartment. Among them was a Purple Heart….that was buried in the bottom of a draw. My mother wasn’t surprised and said he was injured during the war. We also found the pictures he had hidden away of his squadron with the dates of death and names written on the back. Everything was saved, I believe my mother has the pictures and the Purple Heart in a bank deposit box. What I liked about Fata Morgana is that it was on point with everything that my grandfather had told my son and myself. From what the crews wore, to how the gunners were strapped into the shortwave radio operator to the people who handled the bombs, 100% accurate. The science fiction aspect of the book was well written too. I liked that the Fata Morgana was taken 200 years into the future. A very bleak future, might I add, where the remnants of human society are forced to live in two domes in a crater. They are also fighting each other in a war that is as old as the domes themselves. Very surreal. The B17 crew had to be my favorite characters to read. The personalities of each one come across the pages and make you smile. What I also liked is that the authors stayed true to how men from that era acted and their views on women and people of nationalities/color. I also like that they all smoked like chimneys. I did like the romance between Captain Farley and Wennda. It was innocent, with only a kiss but it was real and I liked it. There are a couple of twists that are thrown into the book that took me by surprise as I read it. One of the twists was big and it changed how I viewed the world that Wennda lived in. There was so much action and at one point, I was on the edge of my seat chanting “You are going to make. You are going to make it”. Want to know why I was chanting that? Read the book!! The end was very bittersweet. I have a theory about what happened at the end of the book but I refuse to ruin the book for people. It is best that you read the book for yourself. Because I feel that people will have the same theory as I do. Why: This is a book that will go on my keeper shelf. It was action packed with memorable characters who quickly got under your skin. The storyline was pretty good too. It did lag in a couple of spots but the authors did a great job of getting the book back on track.